Our four-week road trip had its valleys and its peaks. There were a lot of really tough moments on this trip for all of us, but it seemed especially for our youngest, Noah, that he just wasn’t okay with leaving his daily routine in his lovely home. I can’t tell you how many times into the trip that we thought about turning around and coming back home. When you’re with a toddler that’s unhappy and you’ve got to travel 2500 miles round trip and you’re staying in homes you begin to question the task in front of you. Anyway, four weeks later,we’re home and now my son, who before we left for our trip would happily go to bed without being rocked to sleep, now seems to cry at the very idea of going to bed, and he now wakes about 3 times a night, since coming home (which is still less than it was while we were road tripping it). The other night, while I was rocking Noah for about an hour helping him to calm down and go to sleep, there was just one thing on my brain. I must get rid of Facebook. I’m not sure that I would call it a moment of clarity, and I have no idea why it was then that I thought this, but it was perfectly clear, in that moment at 3 AM, I wanted to send my Facebook account down the drain with the rest of all the fluff the internet distracts me with. It’s like a 24-hour buffet of hit-or-miss food and I just can’t stop eating there. I need to unplug from Facebook and I need to reconnect with things that I can touch and hold. I need more space to nurture my well-being and to replenish my coping skills – to fill up my cup. I need more time to write, or maybe just to sit on the couch and do nothing but listen to the quiet of my kids asleep, and the gentle song on the radio and smile at the dog – without a laptop within arms reach. I feel like Facebook is a dual edged sword and there are days when I love the community that I have there and then there are days when it’s stealing my time and resources from my family, loved ones, and myself. I’m not sure that stopping Facebook will help me achieve reconnection and healthy emotional nurturing, but it’s going to certainly give me more free time. And I need to have time where I don’t feel compelled to prove anything, or driven to keep my feed interesting, or have to chug out one more hit meme. I need more time to heal, to regather, to listen, to play with my kids, to go to the gym, to read books from the library, to meditate, to cook, to put away laundry, to go to bed earlier and to start my day with a cup of coffee in my hand and a smile on my face, and not wonder about what’s happening in the thunderdome (i.e. Facebook). For now, I plan to hand my Facebook over to Peter. He’s going to create a password for my account that I won’t know. This will allow me to link up my blog posts to my Facebook pages and feeds, but not have the opportunity to invest additional time in the virtual world instead of my real world. That means for the next couple of weeks I’m not going to see or read any comments on my pages, so if you want to comment, please do so on these blogs. I hope to write again. I mean really write, but even then, if I don’t it’s okay. What I really hope to do is feel okay again, to regain my coping skills. And part of that will be found when I turn off some of the outside noises and find contentment in little things, allowing me to be more present in the life right in front of me. Until then, this weekend I’m signing off – it’s going to hurt so good. 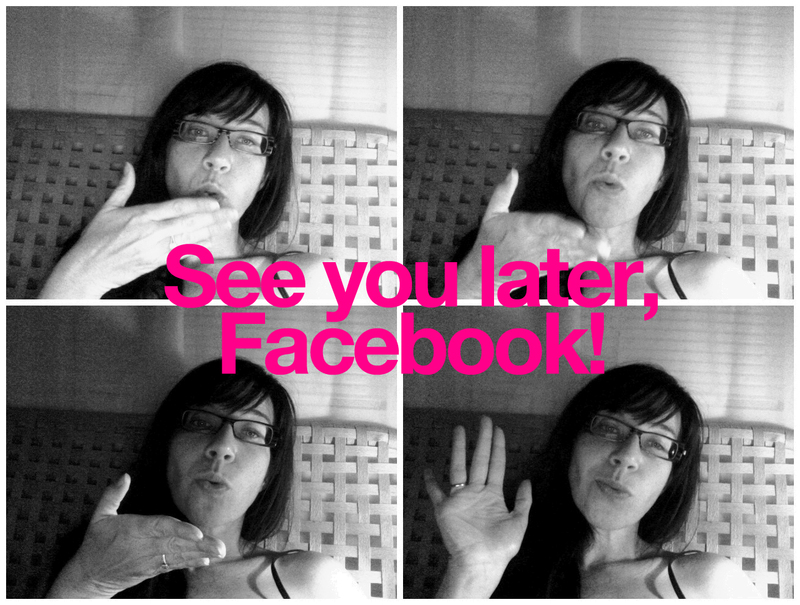 I left Facebook (kind of) after I suffered 2 miscarriages. I don’t think I was depressed, but maybe I was having some minor depression. I was grieving, and I felt the need to withdraw inside myself and just focus on my healing process. I basically changed all my privacy settings so that nobody could post on my wall, and so that my posts would not be seen by anybody but me. I warned everyone via a FB post what was happening, so that they wouldn’t think I had unfriended them. That way I could still check in from time to time to see what my friends were up to, but I would not feel tempted to social network myself. After a 9 month break or so, I came back. So I totally understand your need to unplug. Take care of yourself! You deserve it. It’s only been 10 days, but I’ve done the same thing. I needed a break from Facebook. I didn’t shut it down completely, I’m just taking a 30 day break, maybe longer if I enjoy it. I have more important things to do than sit on Facebook all day, not really, but I’d like to think I do. GOOD JOB! HOORAY for the haitus and blessings to you and your writing. I just wrapped up a 7 day “fast” from news and social media (facebook, meetup, etc) this evening at sundown. I was just fed up with all the media sensationalism and information overload and I wanted my own thoughts back. I’ll admit I had a paradoxical experience, cycling from peaceful days to restless nights, yet it was very much worth it. For me, I’ve come out of it with a renewed desire for the simple and slow life and committment to one day a week of rest, a return to a real, tangible existence. I had a quick question for ya: what is the name of the blog/website that you introduced to me when I first got pregnant. The hilarious yet informative one?